Kaziranga National Park is located in Golaghat and Nagaon areas in the Indian state of Assam. The park with two-thirds of the world’s one horned rhinos was declared a UNESCO World Heritage Site in the year 1985. Although the park is home to a variety of flora and fauna, the main reason why the majority of the people come here is to catch a glimpse of rhinos. Besides, tigers also draw tourists to the park that was declared a Tiger Reserve in 2006 due to the high density of tigers in its protected areas. 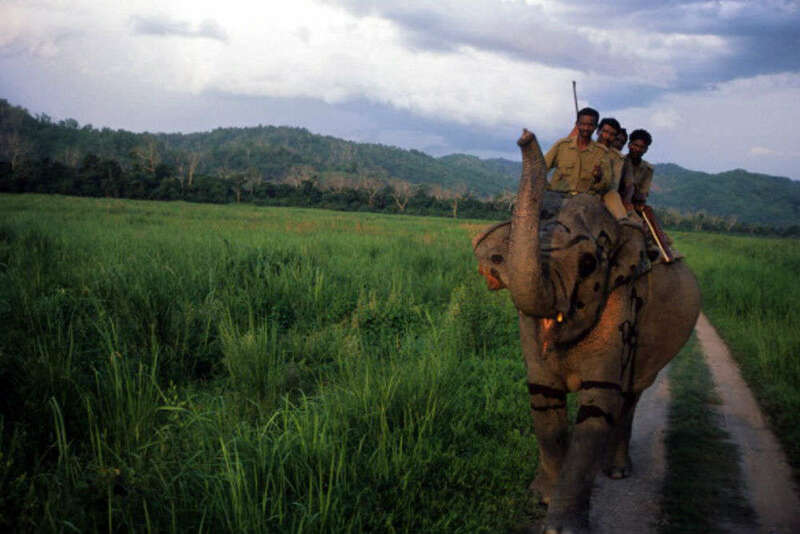 Although there are doubts about when you can and should ride elephants, with many activists saying never, the park says that these adult elephants were earlier working (logging) elephants that are now retired, and were not reared for tourism purpose. During the elephant safari, the baby elephants follow mother elephants on their own free will. It’s very adorable! All the elephants remain at ease, and the babies are never ‘broken’ but learn their tame ways by watching their mothers. During the safari, the elephants stop and eat whenever they feel like doing it. By riding the elephants, you can get very close to rhinos without any hassle. There has never been a rhino attack and you can get amazing photos, especially in the morning. In comparison, during a jeep safari, you will only see rhinos from far away. The jeep ride is less exciting but better for those with disabilities or someone who is nervous about going into the jungle on an elephant. You may want to know the reason behind the decreasing population of rhinos. Primarily, rhinos are killed for their horns, used in Eastern or Chinese medicines. 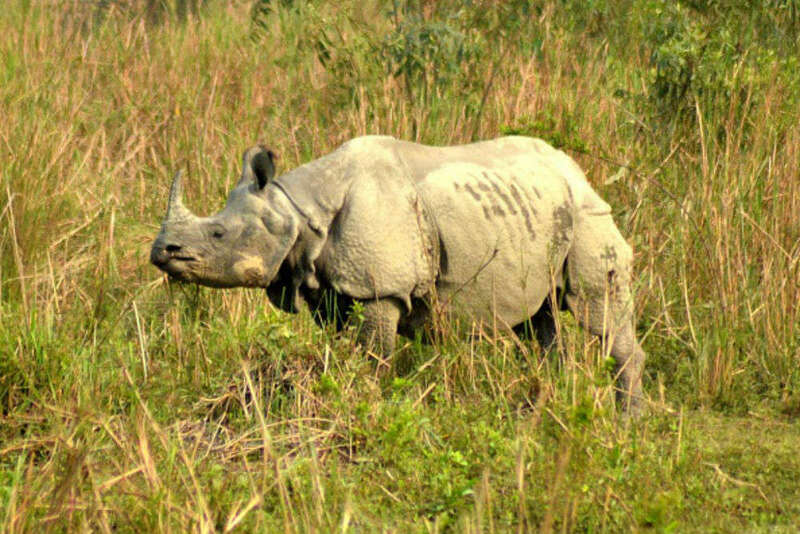 Between 1980 and 2005, 567 rhinos were hunted by poachers in Assam. However, aerial drones are now used to watch and protect these animals. Elephant safaris are early in the morning around 5 am. You can also take a late afternoon one – the sun sets early in Assam at this time of the year, so the timing would be around 3 pm. Jeep safaris go through the day with a lunch break for the staff. They’ll choose a range for you to go on. The west has most of the rhinos, while the east is good for food. There is a lottery of sorts that will let you know which option you get. We found out the night before we went, thanks to our hotel. Take a jacket and wear clothes you don’t mind getting a little dirty. After the elephant ride, we were free to walk around with the babies and they were very playful, laying their trunks on our shoulders. As they were playing in the dirt, our clothes became dirty too. Do not go on your own. You’re not allowed and also, it is not safe as other than tigers, there are cobras and pythons in the jungle. Stay in your jeep or on your elephant. Two people can ride on one elephant. I won’t list prices as they change yearly. Foreigners will pay more than Indian nationals. The elephant ride costs more than the jeep safari. Once you pay the entrance fee, you can come all day. Therefore, if you take an elephant ride in the morning you’ll pay the entrance fee plus safari fee. In the afternoon, if you take a jeep safari, you only have to pay the safari fee and no entrance fee. The guides will not ask for a tip, but you can tip them. Make sure to arrive on time. The jeep ride will last for about three hours, while the elephant ride will only be for an hour. One hour is enough as it starts getting uncomfortable sitting on the elephant after some time. The best time to visit is November to April, and the park closes during the rainy season as there are floods due to the rivers meandering in the national park. Much of the park is swamp and grassland, which is why the rhino is happy to live here. The end of the season is less crowded and perfect for a visit. Next articleHow Can You Attract A Happy And Healthy Life For Yourself With Positive Self-Talk?